Despite the colossal array of corrupt misdeeds committed by Bob Lambert and his disgraced political secret police unit the Special Demonstration Squad (SDS), a professional associate in his new academic career, Stefano Bonino, has been moved to write in his defence in Times Higher Education. A central and defining focus should leave plenty of evidence behind it. Yet among the exposed spycops is a central focus on groups who presented little or no threat to life. As well as targeting trade unionists brandishing lethal leaflets and environmental groups with their deadly sitting in roads, the SDS spied on a swathe of justice campaigns, perhaps the most well known being the Stephen Lawrence campaign. This is now regarded as one of the most shameful acts in the history of the Metropolitan Police. at no time in my tenure as an SDS manager - which is from November 1993 until when I left in 1998, which was roundabout the time of the Stephen Lawrence Inquiry - at no time was the Special Demonstration Squad concerned in smearing their family or their campaign. However, the findings of last year's comprehensive report by Mark Ellison QC are quite clear. They did target Stephen's family. Bob Lambert was overseeing spying on the Lawrences, with nine officers gathering intelligence on the family. The time they are talking about is not the immediate aftermath of Stephen Lawrence's murder. It is five years later, as the Met was preparing for final submissions to the MacPherson Inquiry into the killing and the police response. Lambert brokered a meeting between his Lawrence spy N81 and the team formulating the Met commissioner's public response. The Ellison report's findings were pretty blunt about Lambert's actions. Take a moment to think about the phrase 'potentially violent'. Consider how it is being used, and how it could be used to justify spying on absolutely anyone and everyone. But even before we need to address such blanket policing, Bonino's assertion - that the concern wasn't the Lawrence family themselves - has been discredited since the Ellison report's revelation of the meeting Lambert organised. Why else would that meeting take place, except to undermine the position of the family and their campaign? Where exactly was the public order threat, five years after the murder, from the family's submission to the MacPherson Inquiry? WHEN IS A SPY UNIT NOT A SPY UNIT? Bonino has no choice but to concede that much of what Lambert did for years is indefensible, but then mentions the final phase of his police career. If his progressive calls for more participatory and transparent approaches to counterterrorism appear largely inconsistent with the activities of the SDS, the achievements of the Muslim Contact Unit are unquestioned. Really? The Muslim Contact Unit has an untarnished reputation, as you would expect from an organisation run by a secret unit and which has never been critically examined. We should remember that Lambert's animal rights work sounded fine from his own account, but subsequent revelations indicate that it was something else entirely. The Muslim Contact Unit was set up by Lambert and his favoured protege Jim Boyling after the 9/11 attacks. It was ostensibly an outreach unit to foster good links between police and Muslim communities, and to acknowledge that devout Islam is not a threat to the wider society. And maybe that's all it was. I have no evidence to the contrary. But one has to wonder why Special Branch, the secret intelligence gathering wing of the police, would fund a unit if it wasn't there to gather intelligence. If you're not spying why use your most skilled spies who have little experience of anything else? the campaign urging Lambert’s dismissal is undermined by its own hubris. Not only does it fail to differentiate between academic expertise and morality (are all lecturers made fully accountable for their non-academic past? ), it also elevates morality to an absolute virtue floating outside the realm of a complex political world. 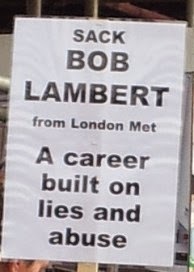 The growing clamour from politicians, opinion formers and the wider public for Lambert to be sacked comes precisely because morality is not divorced from the political world. Ethics must be integral to teaching, and nowhere more so than in the tutoring of those who will have privileged power over the lives of citizens and the political movements essential to democratic society. Should lecturers made accountable for their non-academic past? Yes, if it is a profoundly unethical past that seriously undermines their suitability for the academic post. If lecturer in medicine were revealed to have performed secret, grossly unprofessional experiments on citizens, including sexual deception, that led to record compensation payouts to their victims, they could not expect to retain their post. Likewise, when a criminology lecturer devoted decades to abuse of citizens and the counter-democratic undermining of campaigns for seemingly no reason other than they threaten established power, it demolishes their credibility and legitimacy. The campaigners disregard the authority and competence of universities to assess and monitor the fitness of their employees. 2) Lambert failed to disclose a swathe of information relevant to his post that is now embarrassing the universities and damaging their standing, deceiving them as he deceived the campaigners he infiltrated and the women he abused. Either way, the universities that employ him have questions to answer. But it doesn't stretch credulity to imagine a state-trained liar with decades of experience being able to deceive a university's recruitment staff. ignores the specific context in which Lambert acted and the morass of moral ambiguities inherent in covert policing. Even in that world, Lambert and the SDS were exceptionally corrupt and depraved. The way he and his charges behaved was, in the words of people with a higher level of policing authority than Lambert ever achieved, 'grossly unprofessional' and an 'abject failure'. He did not merely make a personal mistake but developed a methodology using tactics that have shocked the public and been unequivocally slammed by senior police officers. Under his management, that methodology was emulated by those he was in charge of. This is neither intrinsic to covert policing as Bonino asserts, nor is it the 'extremely rich experience in professional practice' that London Metropolitan University's spokesperson claims. The question should really be approached from the other side - if all this is not enough to render him unfit to teach in this field, what is? Unlike someone contrite, he has not readily admitted his wrongdoings until they have been revealed by others. This is the measure of the man today. Even after he was exposed he did not make contact with his activist ex-partner and their son despite knowing of the risk to the child's health from a genetic condition. Instead she found out the truth by seeing it in a newspaper in 2012. She has said that, had she not done so, Lambert would have taken the secret to his grave. So one wonders what else the range of ongoing official inquiries, criminal investigations and court cases will add to the already appalling list. Don't let the police self-investigations like Operation Herne fool you with their focus on the disbanded Special Demonstration Squad (SDS) - this is not a historic problem. The political secret police are still with us. The shifting names and different units leave us awash in acronyms. Here, as far as I'm able to tell, is what's what (corrections welcome!). It's an alphabet soup that swirls before the eyes, so thanks to Jane Lawson for designing the diagram to make it easier to grasp (click to enlarge; right click and open in new tab to have it alongside as you read the post). The SDS was a secret unit within the Metropolitan Police Special Branch from 1968 to 2008. Formed as the Special Operations Squad after an demonstration against the Vietnam War kicked off in March 1968, its temporary infiltration was decided to be useful and made permanent at the end of the year. Somewhere in late 1972 or early 1973 it was renamed the Special Demonstration Squad, a moniker it kept until 1997 when it was renamed the Special Duties Section. There were other units who amassed and collated intelligence from the SDS and other sources. The Animal Rights National Index (ARNI), had been set up in 1985 as 'the ALF squad' before changing its name a year later. It seems that it may have expanded to include activists from other movements. From the early 1990s the Southern Intelligence Unit (SIU) was based in Wiltshire and, with its Cumbrian sister team the Northern Intelligence Unit (NIU), ran a database of eco protesters, ravers, travellers and free party types. There is some indication of a third unit that focused on hunt saboteurs. These units had no 'operational role' of fake-identity spies in the field, they just gathered information and advised police forces. Now comes the Association of Chief Police Officers (ACPO). Sounds like a cosy staff body, and indeed it was more like that when it was formed in 1948. But in 1997 it became a private company and got itself funding to flog police information. Then it took on running the spy stuff by establishing the National Public Order Intelligence Unit (NPOIU). Established in March 1999 the NPOIU was, along with the Terrorism Act 2000, ID cards and detention without trial, part of a raft of New Labour attacks on civil liberties (those who think of state repression as being a right wing tendency should note that the SDS was also founded by a Labour government). Operation Herne, the police's self-investigation into secret political policing, says that the NPOIU was formed as a reaction to the large 1995 protests against the export of live animals from Shoreham in Sussex. The running of the NPOIU was given the the Met, and so it was, to all intents and puposes, a unit within the Met's Special Branch. Although it used serving Met officers for NPOIU spies, because ACPO was (and still is) a private company it was exempt from Freedom of Information (FoI) legislation and so protected even further from public scrutiny. Like the SDS, the NPOIU was directly funded by the Home Office, which hints at an answer to the big question - who ordered all this spying and authorised its methods? The NPOIU absorbed SIU/NIU and effectively replaced ARNI running a database of political activists. It also had an 'operational role,' that is to say they deployed undercover agents in target groups under the aegis of its Confidential Intelligence Unit (CIU). Whilst the SDS was London-based, the CIU officers from the NPOIU went national. The NPOIU was granted a huge budget and began by putting an officer using the stolen identity 'Rod Richardson' into a group of anti-capitalist activists in Nottingham. Within a couple of months of Richardson's departure in 2003, those activists were joined by Mark Kennedy, aka Mark Stone. It was his exposure by activists in late 2010 that alerted the world to the existence of the political secret police. For Operation Herne and other inquiries to focus on the long-defunct SDS but leave out the most notorious undercover officer of them all shows how incomplete an SDS-only picture is. Some managers worked for both the SDS and NPOIU, and officers from both units knowingly overlapped in deployments. Whilst SDS and NPOIU officers knew each other, nonetheless there may well have been some rivalry. As the case of 'Rod Richardson' shows, the NPOIU wasn't initially warned against using the woefully anachronistic practice of stealing the identities of dead children. As an aside, in 2001 the former ARNI boss Rod Leeming left Special Branch to set up a private spy firm Global Open. In early 2010 he head-hunted Mark Kennedy before his police contract had even finished. This indicates that that it's a fairly standard career path, and suggests such firms are tipped off about officers who are leaving and cold-call them. It seems unlikely that Kennedy was the first one they got. With virtually no oversight or firm rules, private spies can stay in the field indefinitely. Indeed, had Kennedy been smart enough to change his name by deed poll to Mark Stone, he'd have had ID in the right name and would probably still be spying today. In 2004 ACPO created a new post, the National Co-ordinator Domestic Extremism, which oversaw both the NPOIU and a new unit, the National Extremism Tactical Co-ordination Unit (NETCU). NETCU was established during the drafting of the 2005 amendment Serious Organised Crime and Police Act which made it illegal to 'interfere with the contractual relations of an animal research organisation' or to 'intimidate' employees of an animal research organisation. Run from Huntingdon in Cambridgeshire, NETCU's remit was defined as 'prevention' and it was tasked with helping companies such as Huntingdon Life Sciences frustrate campaigns waged against them by animal rights activists. NETCU didn't just advise corporations about threats to their profits from campaigns, it took a proactive political role in discrediting and undermining those campaigns. Its website linked to the pro-vivisection Research Defence Society, and the unit issued several press releases boasting of activists being prevented from doing street collections. NETCU's 'mission-creep' saw it move to encompass environmental and climate activists. It also helped the illegal construction blacklisting company the Consulting Association (as documentation from a November 2008 meeting between NETCU and the Consulting Association obtained through an FoI request confirms). Additionally, the Independent Police Complaints Commission says it was likely that every constabulary's Special Branch will have supplied information about citizens to the construction blacklist. A third ACPO unit, the National Domestic Extremism Team, was set up in 2005. It was intended to provide an investigatory function, drawing on intelligence gathered through NPOIU spies as well as Forward Intelligence Teams and Evidence Gatherers, for use by forces across the country. All three ACPO units - the NPOIU, NETCU and the NDET - were overseen by the National Co-ordinator Domestic Extremism, or NCDE. Around the same time, direct management of the NPOIU (and presumably the two allied units) passed to ACPO. In 2006 the Metropolitan Police's merged its intelligence-oriented Special Branch (aka SO12) with the investigatory Anti-Terrorist Branch (SO13) to form Counter Terrorism Command (known as SO15). SO15 is currently headed by Richard Walton. He was moved from his post following revelations about his key role in the SDS' spying on Stephen Lawrence's family in the Ellison report last year. He was quietly reinstated in December even though he is still under investigation. With Special Branch, the SDS' parent unit, now part of Counter Terrorism Command and much of the SDS's work superseded by the NPOIU, the SDS faded. It has been suggested that when Counter Terrorism Command officers took over the SDS they were alarmed at its targets and methods and moved to close it down. The unit is described as 'having lost its moral compass' by the time of its closure in 2008 - as if it ever had one in the first place. The three ACPO units (the NPOIU, NETCU and the NDET) were merged into the National Domestic Extremism Unit (NDEU) in early 2011. At that time they had a combined budget of around £9m per year. At the same time as the name change, management of the unit was then passed from the FoI scrutiny-shielded ‘private company’ ACPO to the (not exactly accountable themselves) Metropolitan Police under the ‘lead force’ model. There had been several reviews pushing for this, including Her Majesty's Inspectorate of Constabulary's report 'Counter Terrorism Value For Money'. Certainly, it will have taken a lot of discussion and planning so it seems very unlikely that the exposure of Kennedy in October 2010 played a part. This didn't stop government ministers trying to portray it as a response a mere week after the Kennedy story hit the media. The NDEU was brought to operate under the umbrella of the Met's Counter Terrorism Command. As happened when they were three separate units, all the ACPO political police operations under the NDEU were overseen by the National Co-ordinator Domestic Extremism, though the rank for the post was downgraded from Assistant Chief Constable to Chief Superintendent, the first holder of the post being Detective Chief Superintendent Adrian Tudway. Despite the budget for political spy units being public when they were run by ACPO, in 2012 the Met refused to follow suit, and with its gift for exaggerated flourishes it cited text from an Al-Qaeda training manual by way of a reason. TheNDEU's remit changed at the same time as its restructure and it no longer carries out undercover operations. It has taken on the 'prevention and detection' tracks previously associated with NETCU and NDET, maintaining a database of activists and working with companies and organisations that activists campaign against. Kennedy-style deployments of undercover officers are now run either by the Special Project Team (SPT) of the Metropolitan Police's Counter Terrorism Command, or one of the regional SPTs run by North West, North East and West Midlands Counter Terrorism Units. Official reports say that this change is, indeed, a result of the exposure of undercover officers as the established anti-terrorism units were felt to have 'more robust procedures for the deployment of undercover officers' than their NPOIU/SDS-derived police equivalents. In April 2011 Tudway sent a private email confirming that the English Defence League were not domestic extremists. Organising racist violence on the streets is fine because it's understood and safe, whereas fluffy but explicitly anti-capitalist things like Climate Camp get multiple officers like Mark Kennedy and Lynn Watson. This isn't key to the story, it just illustrates the fact that it's not threat of political public disorder, damage to property or violence to citizens that concerns the secret police - it's threats to the present parliamentary political norm and police credibility. In 2012 the NDEU split its work into two subunits. The Protest and Disorder Intelligence Unit (PDIU) collates and provides strategic analysis relating to protest and disorder across the UK, whilst the Domestic Extremism Intelligence Unit (DEIU) provides strategic analysis of domestic extremism intelligence within the UK and overseas. Quite how they define 'protesters' as separate from 'domestic extremists' isn't clear. Given their very wide and loose use of 'domestic extremism' in the past, it is worrying that they feel the need to spy on even less dangerous campaigners. But it was ever thus. As Merlyn Rees, Home Secretary in the Labour government 1976-79, said, the role of Special Branch is "to collect information on those who I think cause problems for the state". Although the two subunits are physically separate, they share an intelligence database, the National Special Branch Intelligence System (NSBIS), implying that there is no clear boundary between protesters and domestic extremists. As if in an attempt to close the book on an embarrassing subject, in May 2013 the NDEU was renamed the National Domestic Extremism and Disorder Intelligence Unit (NDEDIU). But there is no reason to believe that the outrages perpetrated by the SDS, NPOIU and associated units have stopped, despite the musical chairs and name changes. When political campaigns are counter-democratically undermined by the state, and participants subjected to sustained psychological and sexual abuse, changing the acronym doesn't change the immorality and injustice.